Charlie Barnett Is the New Best Friend on You and We’re Already So WorriedHe will now depict a different kind of cosmic suffering. Missing Bodies and Missing Curtains: Your Most Pressing You Questions, AnsweredVulture’s resident You expert fields readers’ queries, concerns, and theories about the Lifetime turned Netflix hit. You and The Magicians Showrunner Sera Gamble Is Having One Hell of a SeasonTalking creepy stalkers, fantasy worlds, and why every show should have a hookup-slash-murder scoreboard. Now That You Is on Netflix, You Should All Worship Peach SalingerDon’t steal her Ozma of Oz. Why You Season 2 Jumped From Lifetime to Netflix“The stars have aligned,” says co-showrunner Sera Gamble. Netflix Picks Up Lifetime’s Creepy Penn Badgley Show You for a Second SeasonA new home for the stalker series. You Season Finale Recap: Crazy Ex-BoyfriendOn its way to what feels like an inevitable conclusion, You revealed itself to be as toxic as the masculinity it purports to be taking down. You Recap: Look What I FoundJoe’s deep dark secret is finally revealed. You Recap: It Ain’t Me BabeJoe and Beck have a dramatic reunion after some time apart. You Recap: The Girls Who Didn’t Go to ParisThe cat-and-mouse game between Joe and Peach Salinger intensifies. You Recap: Being Our Most Authentic SelvesPeach runs afoul of Joe one too many times as Beck remains cheerfully oblivious to her boyfriend’s murderous side. You Recap: Father, FiguresBeck introduces Joe to her apparently not dead dad as Peach grows more suspicious. You Recap: Bedtime and Dead BodiesBeck and Joe get to know one another a little better by building a bed. But the corpse on Joe’s basement remains a problem. You Recap: Kidnapped by DangerJoe goes to a party, continues to encourage childhood literacy, and commits some questionable acts as one of Beck’s friends starts to get suspicious. 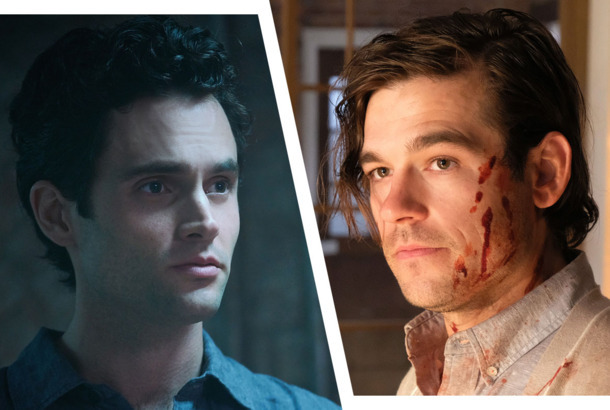 You Premiere Recap: Lonely Boy Is a Psycho NowA lot goes down in the premiere of a new series about romantic obsession and rare books. You, Me and the Apocalypse Finale Recap: Children of GodThis is the way the world ends. Did you scream at your TV screen too? You, Me and the Apocalypse Recap: Emergency MeasuresThe end is nigh. You, Me and the Apocalypse Recap: Hope and Lies“Saviour Day” shows us the darker side of clinging to hope. You, Me and the Apocalypse Recap: Operation Savio(u)rMathew Baynton is adorable, except when he’s terrifying. You, Me and the Apocalypse Recap: We Are FamilyAt this point, anything is possible. You, Me and the Apocalypse Recap: Slough and SteadyMegan Mullally’s performance is brilliantly heartbreaking. YMATA Recap: The Alcopop-alypseThis is a solid hour of TV, but it didn’t need to last an hour. You, Me and Apocalypse Recap: Pope Force OneJust when you think things can’t get any better, Nick Offerman appears. You, Me and the Apocalypse Series Premiere Recap: Christ on a BikeA Manhattan-sized comet is hurtling toward Earth. Rob Lowe is a bad-boy priest. Any questions? Is You, Me and the Apocalypse Just the Jolt NBC Needs?This British import is delightful.